This is one of my favorite designers from the hippie era. One of the designers who worked for them in California back then, contacted me to about how much she loved my store and that it was just like the stores back then. 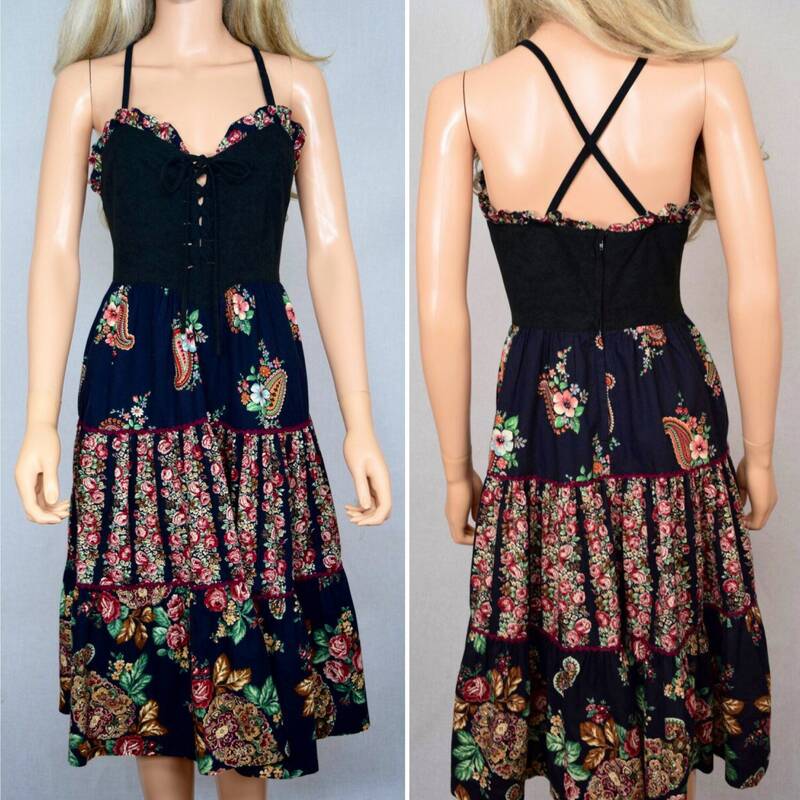 Their clothing stands out as some of the most detailed and desirable for us vintage dress collectors. I have many of her dresses in my personal collection, they are amazing! Arpeja was a California based company, producing a popular junior line starting in 1964. It was inspired by the Edwardian craze from Britain, most often romantic, colorful, and trendy. 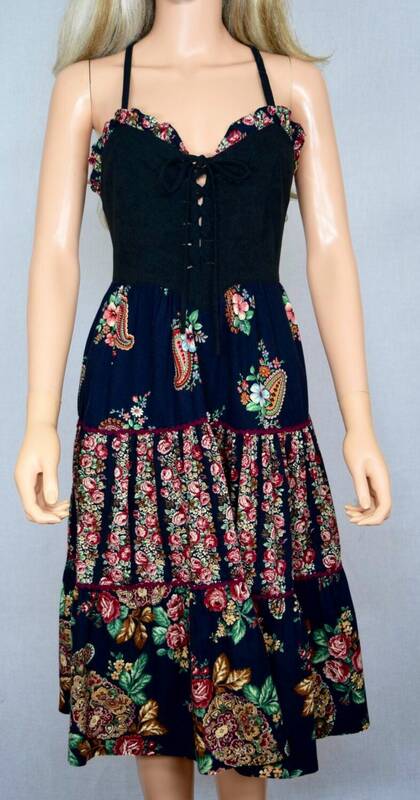 Very cool dress which captures that iconic hippie boho look we all desire from back then. Pair this dress with some campus boots or platform sandals and you've got the look! Very versatile in that you can throw a little sweater on with it and still wear this dress in the Fall. 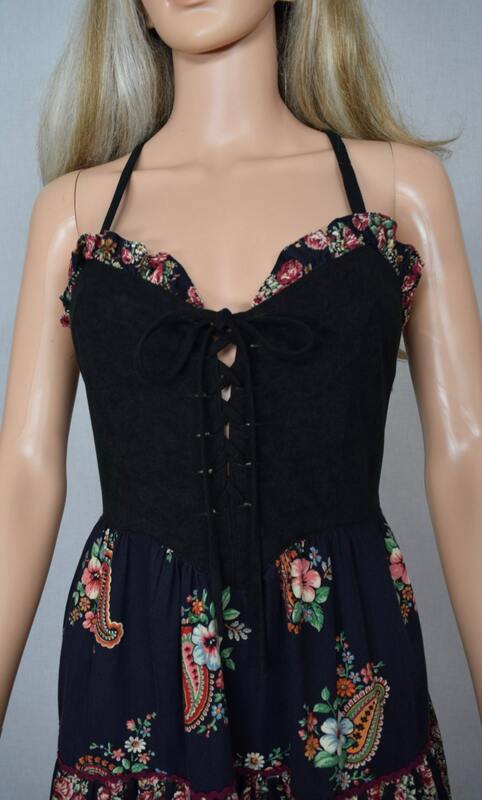 Top portion is a soft acrylic fabric which laces up in a corset style. Ruffles around the top of the bust area. Heart shaped waist in that it comes to a point. Criss crossed straps in the back. Ric Rac trim on the skirt portion. The skirt portion is full in the hips. 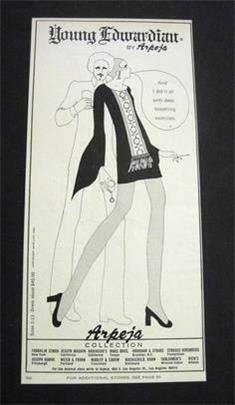 This brand was sold in high end boutiques and department stores back then and was worn by the fashionable hippie ladies. Fabric: Cotton and poly blend skirt portion and the top is an acrylic soft fabric. High Waist: 26 - 27"
Length: 43" From top of shoulder strap.